When sixteen-year-old Rosemary Card left Salt Lake to become a model, she had no idea what awaited her in New York City. As her career took her around the globe over the next two years, Rosie experienced the highs and lows of the fashion industry and learned firsthand the strength found in being true to yourself, listening to guidance from the Spirit, and discovering confidence as a single LDS woman. Now retired from modeling, Rosie shares her inspiring true story of how focusing on developing her mind and heart in the process of becoming more like Christ blessed her with opportunities and challenges she could never have imagined! I love reading books about people that make up our world. I’ve followed Rosemary Card and her QNoor account on Instagram for a long time. Not only does she have a beautiful line of Temple dresses, she’s just an amazing person. She’s been a lot of places and has a lot of stories to tell. That’s one thing that makes this book work so well! I loved the way she writes about her life. Her life has not been the standard Mormon girl life by any means. But it’s worked for her. It’s gotten her through hard times and to the amazing woman that she is now. 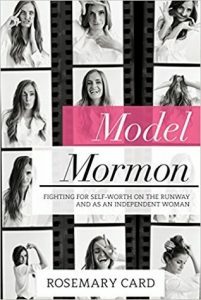 I loved reading the things she’s learned through her own experiences as a model, as a missionary, as an LDS Church employee, entrepreneur and also as a single adult woman. She’s had so many experiences that she is able to not only tell you about, but use to teach you a lesson that you otherwise wouldn’t have known. I especially loved reading the part where she talked about wanting to hear more of woman’s voices during LDS General Conference. Not only did she talk about this issue on her social media, but she also took the time to write to our Church leaders about it. That shows an amount of courage that not many possess. There are so many things we can learn from women like Rosemary Card! I was sent this book as a gift by the publisher. All opinions are my own. This post contains affiliate links. This means that if you click my links and make a purchase, I may receive a commission.